Location, location, location! That is what you get when you stay at Harrahs Hotel Las Vegas. We’re not saying the rooms are bad or anything. They’re fine. And we’re not saying the restaurants are bad or anything. They’re fine. But at Harrahs Hotel Las Vegas, the location is really the star of the show. On one side is the LINQ and its plaza, loaded with great shops, restaurants, entertainment and the High Roller ferris wheel. On the other side is the Venetian, the sultan of swank (kindly ignore the Best Western Casino Royale in between). Right across the street is shopper’s paradise AKA the Forum Shoppes at Caesars Palace, along with The Mirage and all its Beatle-y goodness. Besides one of the most enviable locations on The Strip, Harrahs Hotel Las Vegas is chock-full of entertainment options to keep you busy. There’s magic from Mac King, comedy from Ralphie May, Menopause The Musical and some adult entertainment called X Country. Furthermore, the Righteous Brothers just started a residency at Harrah’s! Lastly, we don’t want to spread this around too much lest he get TOO popular, but the best free entertainment on The Strip happens at Harrah’s and his name is Big Elvis. Stop by The Piano Bar mid-afternoon and hear all your favorite Elvis hits from a truly big man named Pete Vallee who sounds exactly like Elvis Presley! And you know he takes requests. Once the sun goes down you’ll want to hit Carnaval Court, a fun spot for outdoor entertainment. 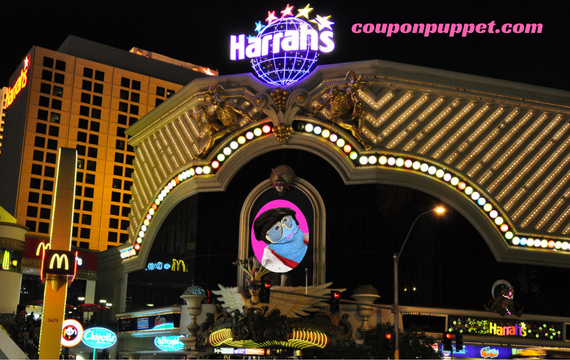 Coupon Puppet Loves Saving You Money At Harrahs Hotel Las Vegas!